There’s lots of honey in the supers left over from the winter stores, so last week I decided to take a bit for us. I checker boarded the supers last fall, alternating frames full of honey with empty frames to give plenty of space and discourage swarming, so there were four frames of honey in the top super: perfect for my first harvest. I put in a Porter bee escape below the super, which is a one-way passage that allows the bees to move down into the hive, but not be able to return to the super. The next day there were only about 100 bees left up there, and it was pretty easy to sweep them off. We bought our own extractor and strainers so we wouldn’t have to haul the frames all the way to Georgetown, and I’m glad we did. It has a hand crank and two baskets inside to spin the frames and sling the honey to the sidewalls. 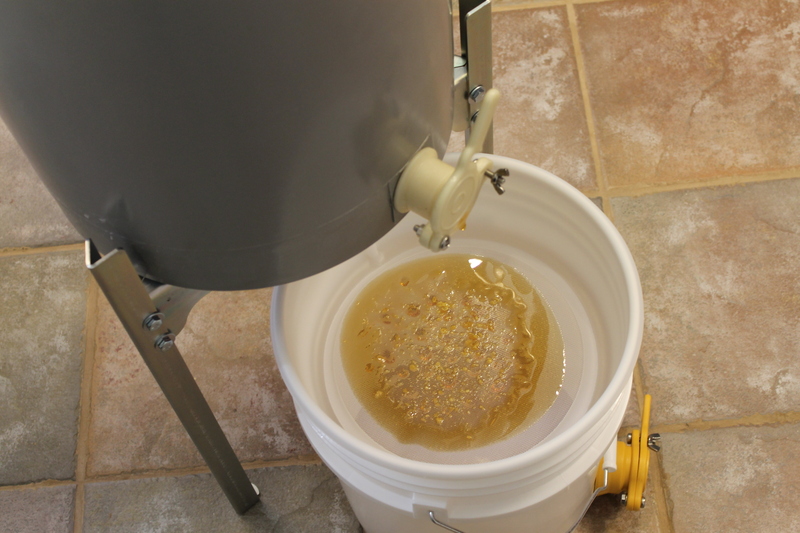 The honey then drains into a bucket with a strainer to remove debris like propolis and bits of wax. 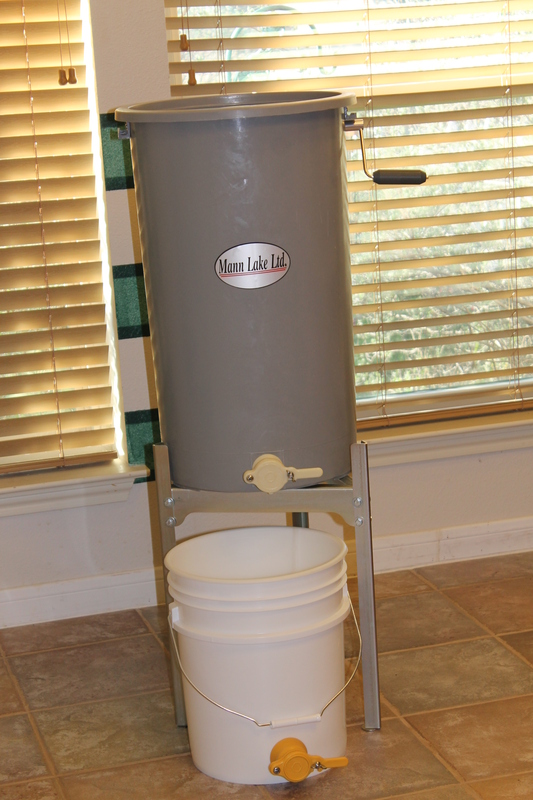 Hial helped fund a honey extractor. 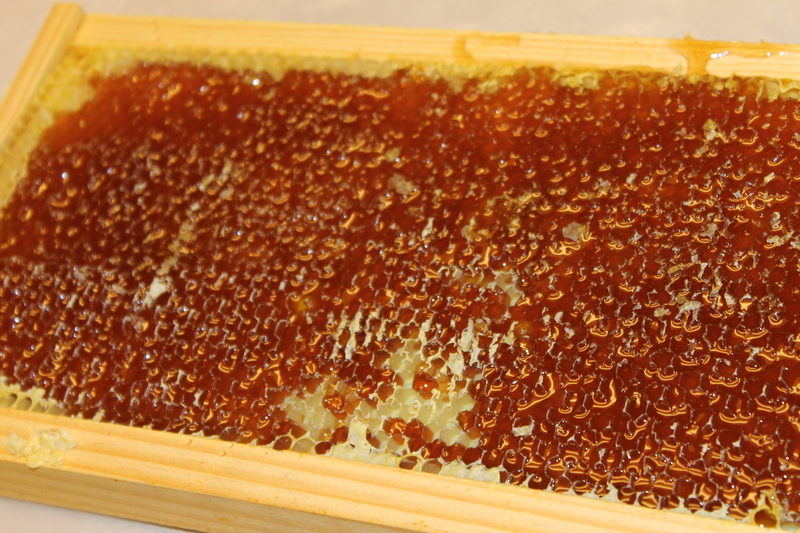 The honey has a thin layer of wax over the top. I removed one side at a time from the first two frames, revealing gloriously dark honey beneath. Some beekeepers use a hot knife (or a heated electric knife, if they’re really fancy), but I have a small tool to lift one section of wax at a time and it worked just fine. A knife might be faster, but having only four frames I wasn’t in a rush. 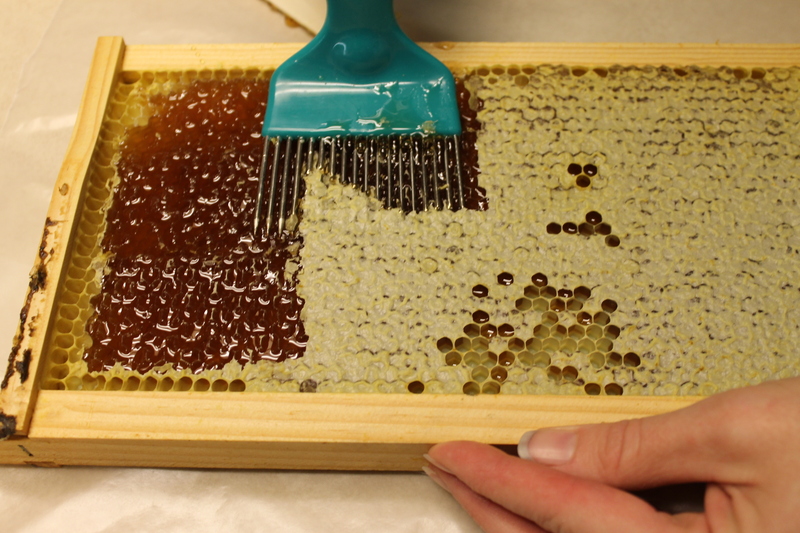 The tines slip under the capping, leaving the comb mostly intact so the bees can do a little repair then refill the cells. 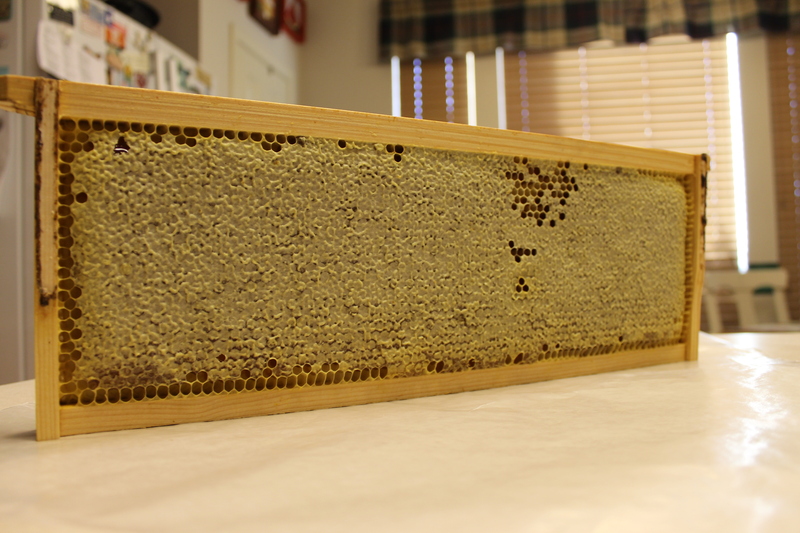 One side of a frame of honey, ready to go in the extractor. 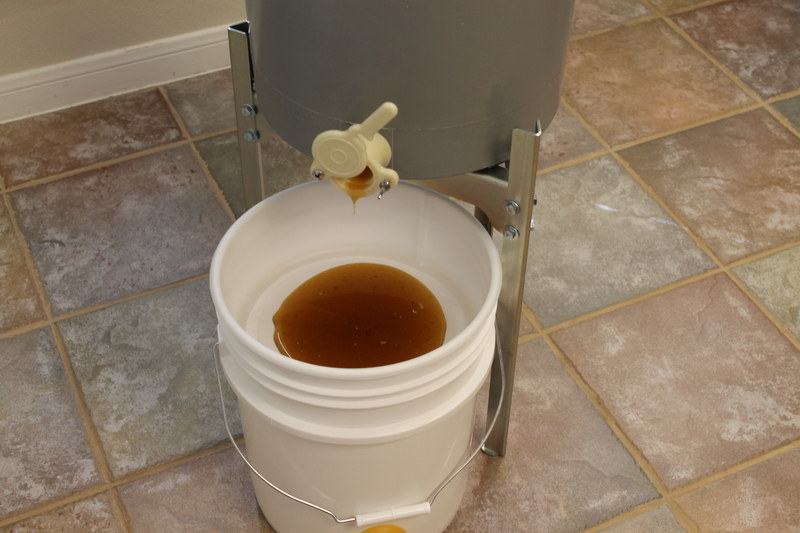 After spinning the first sides of the first frames, I didn’t think we’d get much honey, but then it started sliding to the bottom and making its slow way through the gate and into the bucket for straining. 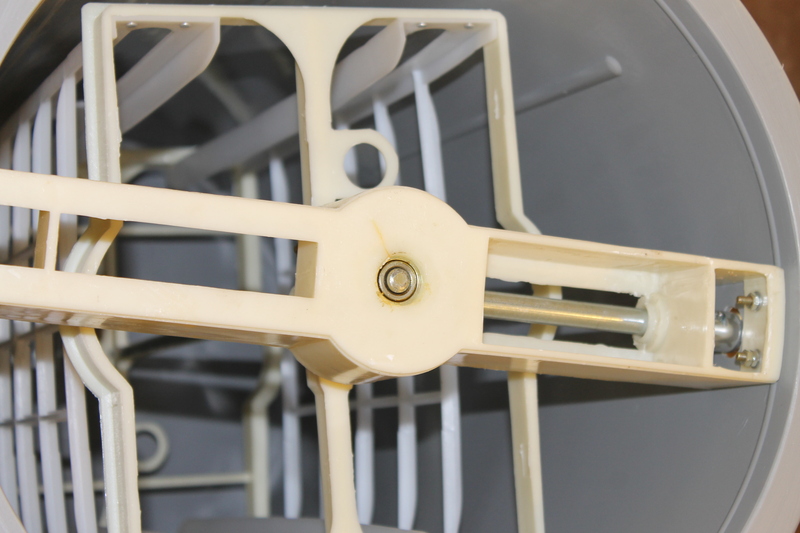 Honey in the bottom of the extractor. 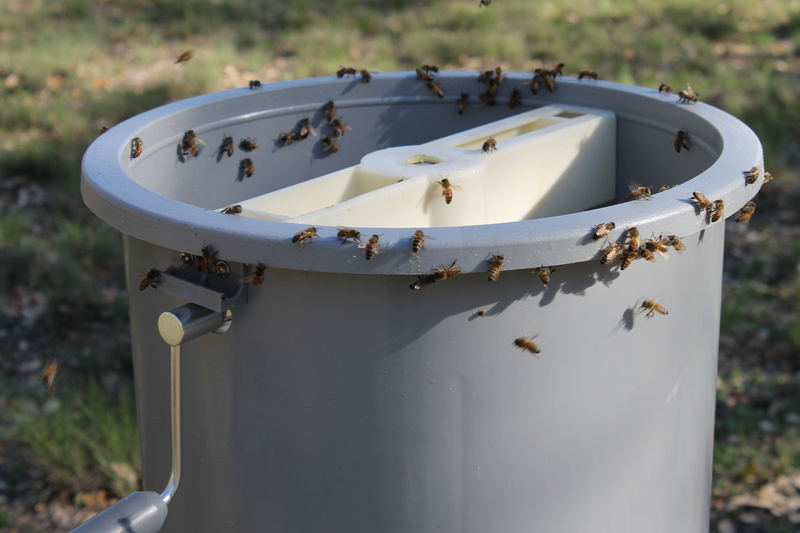 Bits of wax and propolis are collecting in the strainer. It’s pretty healthy stuff, but not as tasty on a biscuit. 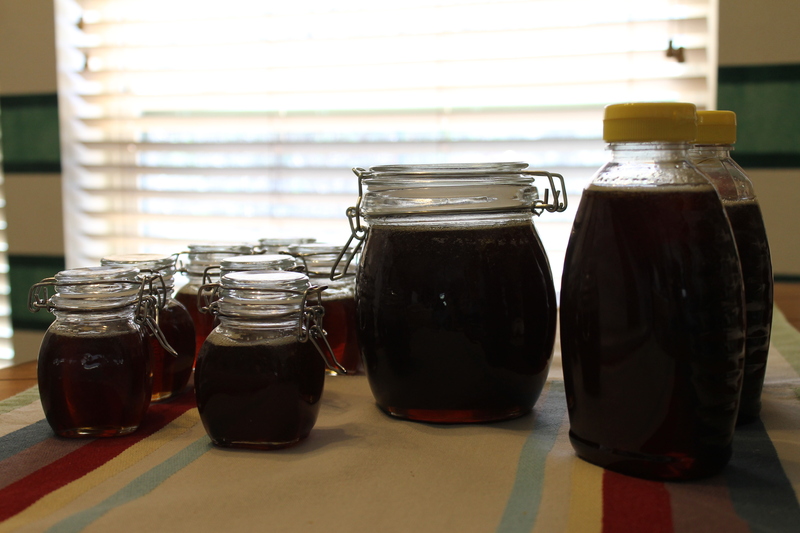 After extracting all four frames, we had more honey than expected: about ten pounds! Thanks to friends and family, I quickly found homes for all of it. I hope they are enjoying it as much as Hial and I are. 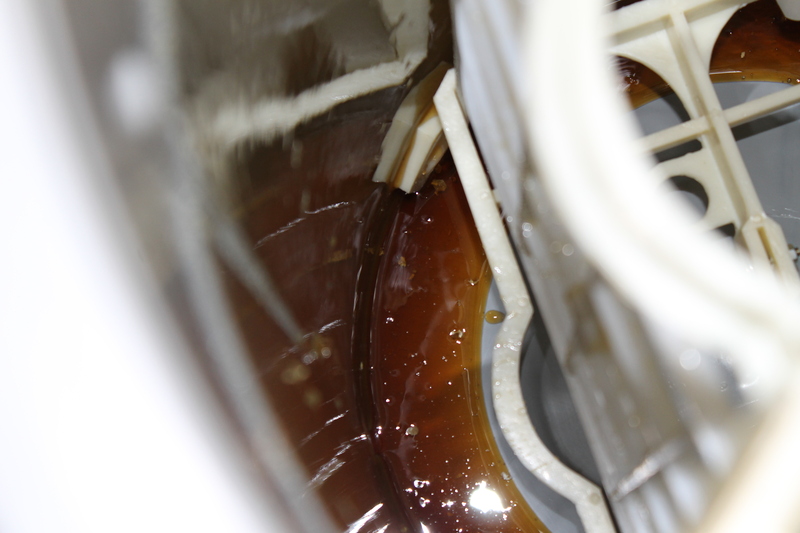 After putting all the honey in jars, there was a bit left in the bottom of the extractor, but not enough to drain out. Bees don’t let anything go to waste, so neither will I. I set the extractor out in the front yard, well away from the hive to prevent wild bees from trying to get into the hive. Within an hour or so, a few bees had found it. By the late afternoon, it was crawling with bees. Many stayed on it overnight rather than returning to the hive. After about two days, it was completely cleaned of all the leftover honey. It just needed a quick rinse and is ready to go again.